The Fatso Motor, built from Harley OEM parts. (except crankcase, flywheel and connecting rods). Will drop right into any vo Softail frame! Original H-D 1550ccm cylinders, Twin Cam heads and rocker boxes. Displacement 100.2 cu.in. and 40 Nm torque, with stock CV carburetor and slightly modified stock exhaust. We have combined the lower end of the well proven Evolution Motor with the upper end of the new Twin Cam Motor. From the Evolution Motor we retained all known components like Timing Cover, Oil Pump, Lifter Blocks, Oil Filter and Single Cam. Then we added from the Oil Pump, Lifter Blocks, Oil Filter and Single Cam. Then we added from the new Twin Cam Motor the upper end omponents like the larger OEM cylinders with pistons, cylinder heads and rocker covers. The "Fatso" Motor. Assembled from Harley OEM parts. *Except crankcase, flywheel and connecting rods. 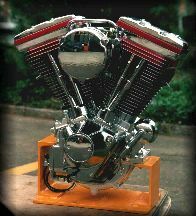 Due to the use of the new and bigger, but shorter Twin Cam cylinders, the crankcase can be heightened with the result of a 4.25" stroke, and a displacement of .... 100 cubic inches !!! 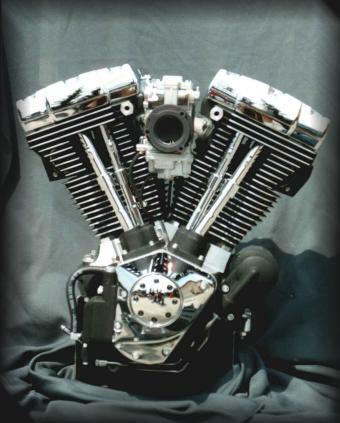 You can continue to use all the components that proved to be reliable in the past (like your own choice of cams, Dyna S ignition or billet aluminum lifter blocks and Timing Cover) The motor is built from anytime available and stocked Harley Davidson OEM parts. * Except crankcase, flywheel and connecting rods. 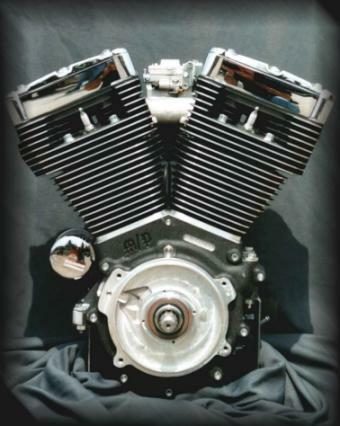 As opposed to the Twin Cam Motor, this "Fatso" Motor will drop right into the Softail frame and is compatible with the stock OEM 5-speed transmission Better cooling of the motor due to the larger cylinder fins. And the best part, this "Fatso" Motor has .... 100 cubic inches !!! The Short Block version offers you the possibility of using components you might already have, or of using other aftermarket products as per your customers request, or buy the rest of the parts from Harley direct at your dealer cost. You can assemble the motor yourself at your customers expense, which is equal to labour, and profit The complete motor as well as the short block version can be ordered in black or silver. Additional information will soon be made available through the press. Original H-D 1550ccm cylinders, Twin Cam heads and rocker boxes. Displacement 100.2 cu.in. and 140 Nm torque, with stock CV carburetor and slightly modified stock exhaust. The Fatso Motor, built from Harley OEM parts. (except crankcase, flywheel and connecting rods). Will drop right into any Evo Softail frame!